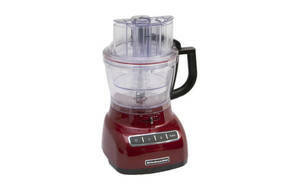 Snapshot: The KitchenAid KFP1444 food processor has 2 speeds and a storage box for attachments. How does it rate? Excellent at slicing carrots and chopping breadcrumbs. Very good at grating cheese, kneading pastry and emulsifying mayonnaise. Storage box for all accessories, all bowls stored in unit. 3 chute sizes (large chute has safety locking system). Comes with two different-sized bowls. Has “thick to thin” lever to change thickness of slicing blade. Some blades are accessible by hand through the medium chute. Large bulky unit difficult to store.